Just a reminder that there will be no Scanfest today. We'll see you on September 27th! The MARTIN line is my children's father's maternal grandmother's family. They originated from Strasbourg in what is now Alsace-Lorraine, France. This area has been fought over by the Germans and French for a couple of centuries and so the location name has consequently changed many times. Ahnentafel #28 - Francois Joseph MARTIN (1828 - 1887) - born in Strasbourg, he immigrated to the United States where he married his wife, Rachel HUBBY, in Illinois by 1848. After farming for some time in Lind and Jones Counties in Iowa, they removed to Bon Homme County in Dakota Territory (now South Dakota). Ahnentafel #14 - John Franklin MARTIN (1854 - 1928) - John worked for the railroad for much of his life, which may have been the reason why he lived all over the Northern Plains and Pacific Northwest. He and his wife, Angelia Rebecca LUKE, had 12 children, including a set of twins (a genetic trait carried from Angelia's family). Ahnentafel #7 - Leona Mary MARTIN (1906 - 1993) - youngest of 12 children and a twin. Her fantastic cooking provided for her family during the Depression through a diner she and her husband, Forrest Lyton CHAPLIN, owned. Tomorrow I'm back at work after 10 very short weeks of summer "vacation." In my opinion, there was very little of either summer or vacation. However, I can't complain too much. I am gainfully employed in a job with great benefits doing the sort of work that is as enjoyable to me as doing genealogy: working with developmentally impaired middle-schoolers (7th and 8th grades). And, in the words of one of my principals years ago, ours is probably the only field where every year, we get a chance to start new and fresh. Between the start of a new school year and the upcoming Washington State Genealogical Society's 2009 State Conference, I expect light blogging ahead here on AnceStories. My blogging focus for the next three weeks will be on the Eastern Washington Genealogical Society blog, as EWGS is the host society of the state conference. The HOEKSTRA line is my maternal grandmother's line. The name is Frisian and means "from the corner." In English, it is pronounced "HOOK-struh." There are many, many people with this surname whose roots originated from the provinces of Friesland and Groningen in the Netherlands, and since it is a common descriptive location surname, these families are usually not related to each other. 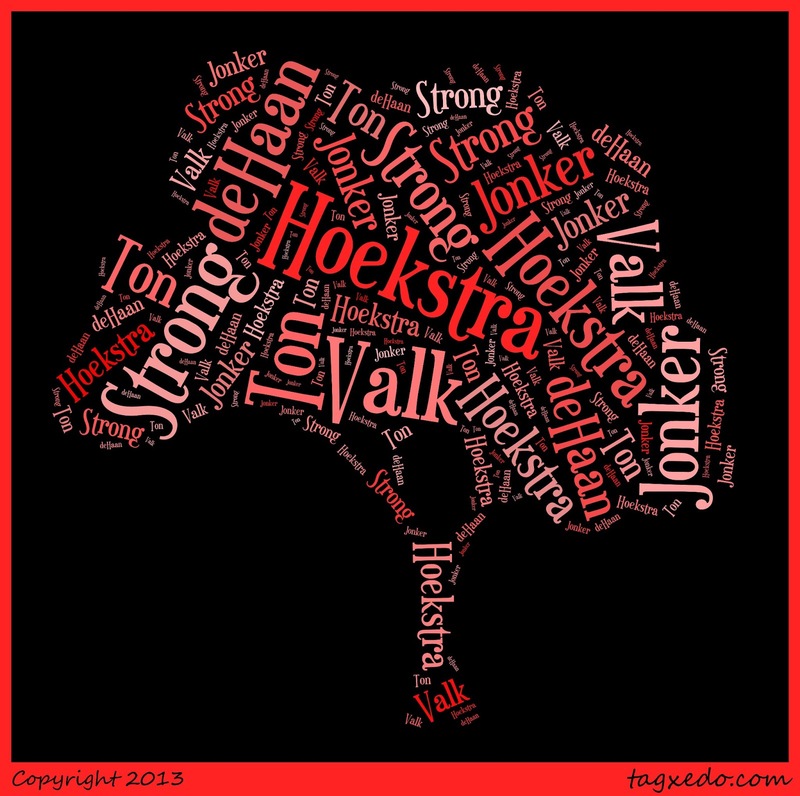 The HOEKSTRA Family History on my website. 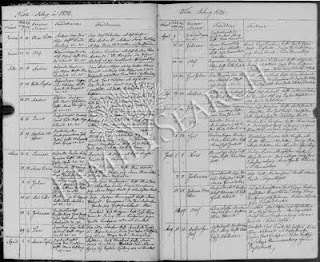 Ahnentafel #224 - Liewe HOEKSTRA (b. c. 1750) - my earliest known ancestor of this line may not even have used the surname HOEKSTRA, since surnames were not required until 1811 in the Netherlands. The only reason I even know his first name is because of the use of patronymics: using the father's first name as an identifying surname, or middle name (once official surnames were used). Ahnentfael #112 - Marten Liewes HOEKSTRA (c. 1775 - bef. 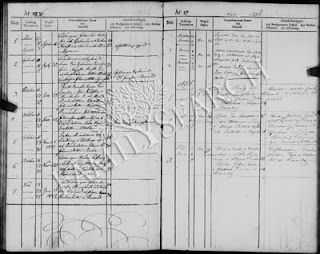 1847) - the only thing I really know about this ancestor is that he married a 43-year-old woman, Fokeltje Jans HAAN, on 14 November 1820 in the municipality (similar to American counties) of Westdongeradeel, Friesland, the Netherlands, and died before she did on 22 Jul 1847, because her death record states she is a widow. They apparently had only one child, my ancestor listed next, who was born eight months before they were married, a situation not at all as scandalous as it would have been if it had happened in New England at that time. 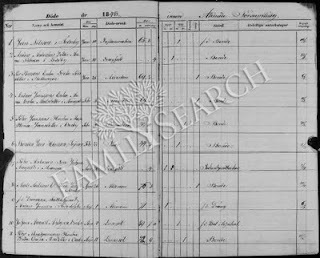 Ahnentafel #56 - Jan Martens HOEKSTRA (1820 - 1909) - Jan was my immigrant ancestor. His first marriage ended when his wife died young and although they had had many children together (including two sets of twins), all died except one child, Geertruida, who accompanied him at the age of 12 in 1867 from Ulrum, Groningen, the Netherlands, to Holland, Ottawa Co., Michigan. Here he immediately married a widow with two children, Grietje (JONKER) DEKKER. Jan and Grietje had several children together, but only two survived, one of which was my great-great-grandfather. After Grietje's death, Jan married yet another widow in his elder years. Ahnentafel #28 - Martin HOEKSTRA (1868 - 1944) - Originally working as a teamster for a laundry company in Grand Rapids, Kent Co., Michigan, where he probably met his wife, Janna "Jennie" TON (a laundress), he later got into carpenty work, both for the railroad and as a private contractor building houses. His railroad carpentry work got him a job for a couple of years in Tacoma, Pierce Co., Washington, a surprising discovery for me when I realized I wasn't the first of my family line to live in this state. Ahnentafel #14 - John Martin HOEKSTRA (1892 - 1975) - I have a few faint memories of my great-grandfather, whom I last saw when I was five. They have been recorded in my AnceStory of him here. Ahnentafel #7 - Ruth Lillian HOEKSTRA - (1919 - 2001) - my dear maternal grandmother. You can read her AnceStory here. 1. 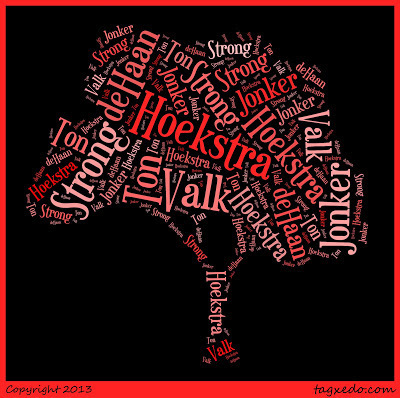 Online database (I update this at least once a month): HOEKSTRA ancestors and relatives (no info on living persons available). I found the following story in my local paper. It's absolutely fascinating. You'll want to read it soon, as The Spokesman-Review archives its articles fairly quickly and then they are only available at cost. A “John Doe” was found dead in a van in downtown Spokane on June 14, 1983. In 2006, thanks to a “cold case” investigation, Spokane County medical examiner’s office staffers discovered his identity: Michael Keith Roberts. Recently, Zak Gilbert, 33, of Fort Collins, Colo., contacted the newspaper. Roberts was Gilbert’s biological father. The WESTABY line is my children's father's paternal grandmother's line. 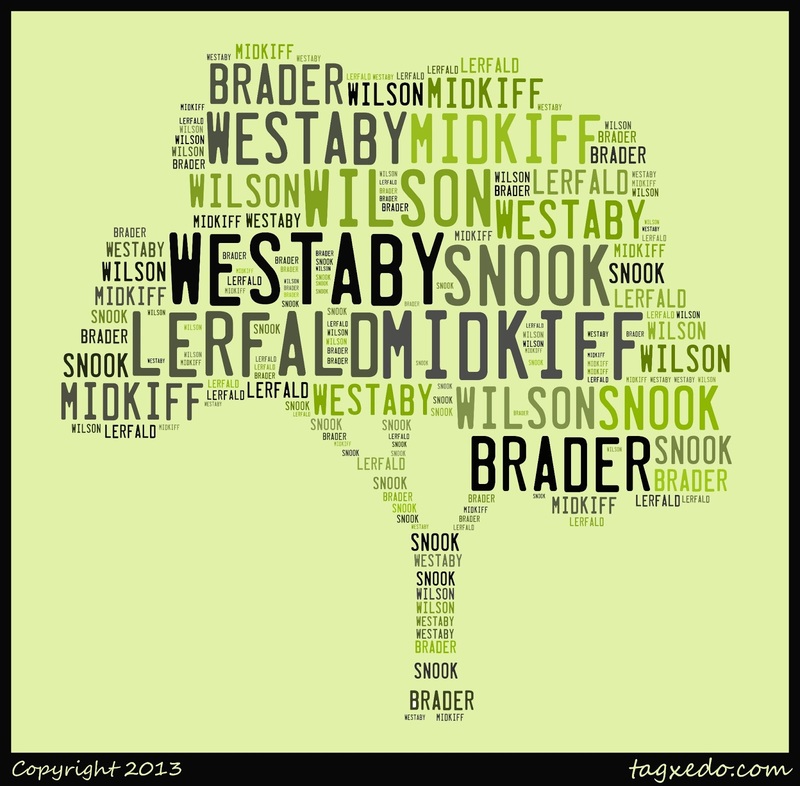 Although common in spelling to WESTBY and WESTOBY, I've found that the former tends to be Scandinavian, while the latter seems to have similar roots to his WESTABYs: from the area of Yorkshire and Lincolnshire bordering the Humber River in England. Ahnentafel #80 - Thomas WESTABY (1779? - ?) - there were several Thomas WESTABYs living in the area around this time and of the right age to be George's father (see next name in this line). "Our" Thomas married Mary SPAULDING in 1808 in Goxhill, Lincolnshire and probaby was born in Barrow-Upon-Humber. Ahnentafel #40 - George Rice WESTABY, I (1822 -1894) - born in Barrow-Upon-Humber, Glanford Brigg, Lincolnshire. George, his wife Ann WILSON, and his brother Charles immigrated to Jo Daviess Co., Illinois in 1850, not long after his marriage. The family is mentioned quite frequently in The History of Jo Daviess County, Illinois (1878). This week was too busy to get regular research done. But that doesn't mean it wasn't a genealogy-free week! First and foremost was my presentation Wednesday evening of "Frugal Genealogy or How Not to Spend a Fortune on Your Family Tree" at the Tri-City Genealogical Society in Richland, Washington. What a fabulous group they have there and I am looking forward to reconnecting with their members next month at the state conference! I had a chance that afternoon to stop by Sunset Memorial Gardens in Richland where my husband's maternal grandparents are buried and was able to stop for a bit and photograph their shared gravestone. I also inquired at the office whether a sibling of the grandfather was buried there, and was informed that he was not. Lastly, the Summer 2009 issue of New England Ancestors arrived in the mail today. Randy Seaver did a post about the details, and like him, I have Vermont ancestors that settled in Western New York, making the articles personally interesting. This evening I will be speaking on one of my favorite presentations, "Frugal Genealogy, or How Not to Spend a Fortune on Your Family Tree!" at the Tri-City Genealogical Society in Richland, Washington. It's a two-and-a-half hour drive south from my home in Spokane, and I will be combining a bit of my own research with this engagement. Because the meeting is in the evening, I will be staying the night at the home of a couple of members who have generously offered their guest room to me. An advantage is that on the way to their home, I will be passing right by Sunset Memorial Gardens, where my husband's maternal grandparents, Forrest L. "Frank" CHAPLIN and Leona Mary MARTIN are buried. I've been to the cemetery once, nearly 16 years ago, for the graveside service of Leona. Frank had passed away 17 years previously, long before I had met my husband and his family. Several years ago, I was able to get photographs of their graves, along with the block, lot, and space numbers for their burial places, thanks to a volunteer at Find a Grave. However, I am planning to stop and rephotograph the graves for myself, as well as determine if any of their siblings are also buried there. I did a quick check through my RootsMagic program, and it appears that between Frank and Leona, only one sibling passed away in the area: Frank's older brother Charles Cornelius CHAPLIN, who died in 1973. 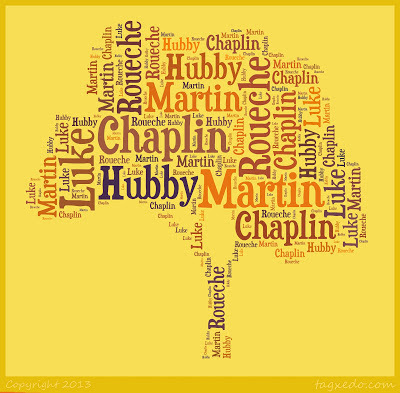 Charlie Chaplin may indeed be buried at Sunset, so I will be inquiring at the cemetery office! I'm looking forward to meeting the members of the TCGS and giving my presentation. 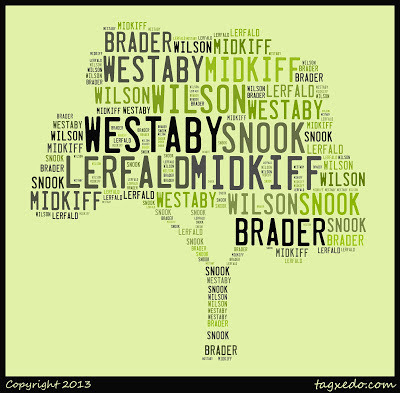 I have met a few of them who have in their turn, spoken at some of the Eastern Washington Genealogical Society meetings (my home society), and I expect to see many of them at the Washington State Genealogical Society's state conference in Spokane in September. The tri-cities area, consisting of Pasco in Franklin County and Kennewick and Richland in Benton County, is a beautiful area, well-known for its orchards, gardens, and vineyards. The wine industry there is second only to California's Napa Valley. Its rolling hills and the many rivers (the Snake, Yakima, and Columbia all merge in this region) make for a lovely landscape, and I look forward to my little get away! There you have it: five of my eight great-great-grandmothers were named Mary; two of my great-great-grandfathers were named George, and another two named James. Although not obvious from some of their birth, marriage, and death places, every one of these individuals lived for a major part of their lives in the state of Michigan, as did each of their descendants that I descend from, through my parents' generation. Using the information here, I can determine that I am 59.375% English, 23.125% Frisian, 3.125% Dutch, and 3.125% Scots. However, I do know that some of the English represented here is actually mixed with a lot of Dutch and Scots, plus a little French. Some of the English and Frisian represented here also has some German as well. I know of no other ancestry; all my heritage appears to come from the British Isles and Western Europe. This garnet ring once belonged to my maternal grandmother, Ruth Lillian HOEKSTRA VALK DeVRIES. It's probably not extraordinarily valuable, although it does have four genuine garnets and is made of 14K gold. Garnets are not my birthstones; aquamarines are, having a March birth. It's not even an antique, but it's worth to me is in its sentimental value and the story of love behind it. Ruth's mother, my great-grandmother Lillian Fern STRONG HOEKSTRA, was born January 10, 1897. The birthstone for January is the garnet. Over the years, my great-grandmother received several pieces of jewelry adorned with her red birthstone from my great-grandfather, John Martin HOEKSTRA. A little more than a year after Lillian died in 1967, John married their housekeeper, Anna STULP. Several years later, I recall overhearing a conversation between my parents. Apparently my mother had received a phone call or a letter from her mother in Western Michigan, in which my grandmother shared her frustration that her father had given Anna the garnet jewelry that once had belonged to her mother. Although I'm not sure, it possible that this occurred in early 1976, shortly after my great-grandfather's death in December of the previous year. It may be that this gift of the garnet jewelry to Anna was decreed in John's will; I'm not sure. Regardless, my grandmother was upset for a couple of reasons: she felt the jewelry, having belonged to her mother, ought to go to her and her sisters (it may even be that her mother once indicated it would); and also, my grandmother, having a January birthday herself, probably felt that having garnet jewelry would be extra special. You must also understand that my grandmother was a generous, friendly person, and never a small, mean individual. My grandfather managed his money well, so although they lived frugally, they well could have afforded some nice jewelry. So Ruth's distress was not out of financial need, but was exacerbated by the fact that she felt she could not go to Anna and ask for the jewelry without appearing to be selfish and demanding. From my childhood memory of the occasion, I believe I remember my mother being upset as well over the situation. I also believe that it was my father who came to the rescue and suggested that for their (birthday?) gift to my grandmother, they would order a nice garnet ring for her. It was likely ordered through Jafco, which is where we ordered all our jewelry in those days, living as we were far from any major stores on Prince of Wales Island in Alaska. The ring was ordered and shipped to my grandmother. I know that she loved it and thanked my parents profusely. 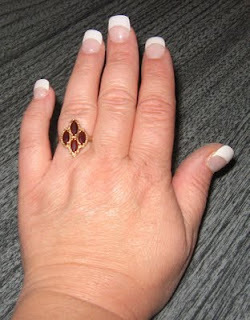 She was wearing the ring when I last saw her when I visited her in Grand Rapids in October 2000. The garnet jewelry of my great-grandmother's was not mentioned again, to my knowledge. After Anna's death in 1992, her family probably inherited it. It doesn't matter; to me, this ring is a precious statement of the love my parents had for my grandmother. When she died in 2001, I inherited it. I don't wear it often; it slips on my ring finger just fine, but my knuckles tend to swell during the day, and often by afternoon, I can't get it off. Since I tend to be claustrophobic about such things, I wear it for special occasions only, for short periods of time. I never put it on without remembering the story behind it; someday, I hope to pass it on to either my daughter or a granddaughter. The HOLST family is my adoptive family line. 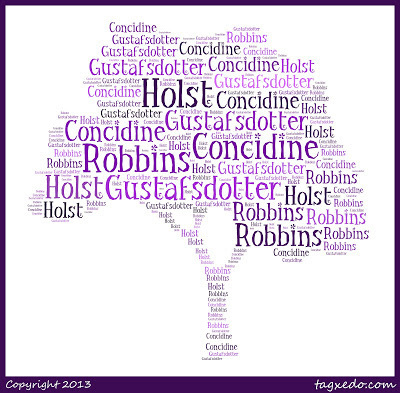 My paternal grandmother was adopted by Alfred Henry HOLST and his wife, Nellie May CONCIDINE. I've been able to trace Alfred's line back one more generation into Hannover, Germany. Ahnentafel #20B - Johann Deidrich HOLST (1860 - 1940) - He married Ida Charlotta GUSTAFSDOTTER, an immigrant from Sweden to Germany, in 1880. Three years later, they immigrated to Western Michigan with their infant son Alfred, to live near Johann's older sister and brother-in-law, Anna M. HOLST and Claude BORCHERS. During WWI, Alfred was investigated by the FBI because he had not completed his naturalization process. 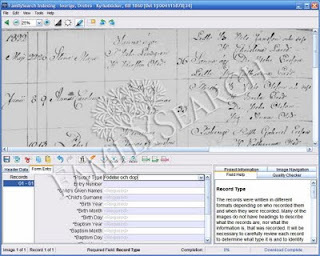 He petitioned to get it completed, and his file found at Footnote contained priceless genealogical information. Ahnentafel #10B - Alfred Henry HOLST (1882 - 1952) - Read his AnceStory here. From obituaries and newspaper articles, I have determined that the HOLST family was integrated well into their adopted American community of Coopersville, Ottawa Co., Michigan, and were highly regarded by the members of that community. 5. 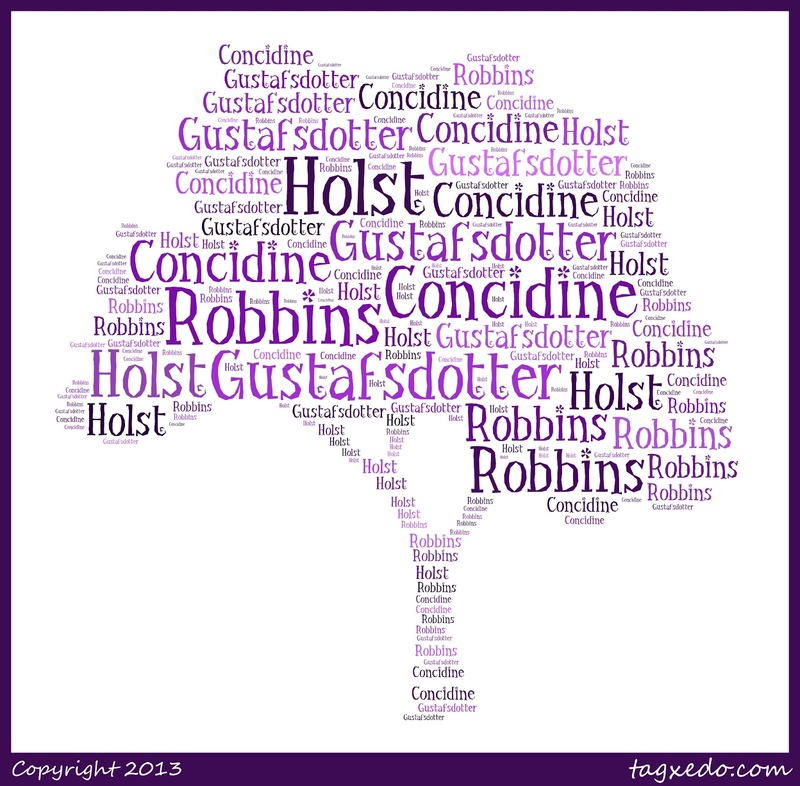 My HOLST Virtual Cemetery on Find a Grave. I forgot to mention in last week's Friday Findings that I had found two of my ancestor's death certificates on the Seeking Michigan website: James W. BARBER and Elizabeth A. "Betsey" COLE were my paternal 3rd-great-grandparents. I had difficulty finding their records on the site because their names had been misspelled. This week, I found their son's death certificate; Orlando BARBER was my 2nd-great-grandfather and he died of smallpox in 1910, which I find rather unusual. Of course, smallpox was still enough of a threat in 1967 when I was born that sometime when I was an infant or toddler, I received an inoculation--my generation being one of the last in America to receive it. I also found Elizabeth's mother's death certificate, again having difficulty because of the misindexing of Lavina (WILLIS) COLE to "Lovina CALE." I also came across a scanned image of the will of my 5th-great-grandfather, Albert William WYCKOFF, on the NEHGS website. In it he mentions his wife Elizabeth (MAINARD), his children, including "Polly CRUTHERS", and some grandchildren with a different surname, suggesting he had a daughter I don't know about who predeceased him. This will is evidence that my Mary "Polly" WYCKOFF CROTHERS CHAPPEL is indeed the daughter of Albert and Elizabeth. All I had previously was an old family history book on the Wyckoff family, which unfortunately was written by Gustav Anjou. My September 2009 issue of Internet Genealogy arrived today. I didn't do much research this week. Some family situations coupled with preparing for my presentation next week at the Tri-City Genealogical Society in Richland, Washington, the upcoming Washington State Genealogical Society's 2009 State Conference in Spokane, and working on my Online City, County, and Rural Directories website all kept me busy doing other kinds of genealogical work. I enjoyed TK Sands' three "I Found..." posts at her blog, Before My Time. She writes how she "found" her great-great-grandmother and her grandmother's baby at the Library of Michigan (actually, she found their death certificates), and also how she found 500 genealogists on Wednesday when a group met in Lansing to protest Governor Jennifer Granholm's plan to close the Library of Michigan. I got to wondering how many of my ancestors could be found at the Library of Michigan, and came up with 21 of my direct ancestors who had died between 1897 and 1920 whose death certificates appear online at the Seeking Michigan website. Additionally, I research my mother's step-father's line, and my paternal grandmother's adoptive line (in addition to her biological line) and came up with two more ancestors between these two families. These are direct ancestors, mind you, all individuals in my 2nd-, 3rd-, and 4th-great-grandparents' generation. These 23 individuals don't count other spouses my ancestors had; nor the collateral relatives that include the other children of my ancestors such as my ancestral siblings, aunts, uncles, nieces, and nephews; nor does it include the plethora of cousins of any number of degrees of relationship that can also be found. 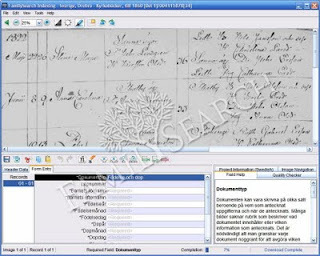 FamilySearch Record Search provides death records (in liber-style vs. the death certificates that began in 1897) for all Michigan counties from the time of civil registration in 1867 to 1897. Ancestry has a Michigan Death Index that covers the years 1971 - 1996. This leaves fifty years (1921 - 1970) of unlisted deaths, with the exception of a few counties whose county government websites have produced a death index. In those 50 years I have another 19 biological, four more adoptive, and four more step-ancestors who died. No matter how the budget works out for the State of Michigan, it does not appear that the death certificates for the years 1921 to 1970 will be available in indexed or scanned form any time soon (although they can be ordered individually from the State).